Following the lead of CNN’s Brian Stelter, Thursday’s Situation Room touted the spike of sales in the book 1984 and strongly hinted that Americans view the Trump administration as the real-life version of Big Brother portrayed in George Orwell’s classic. CNN's Brian Todd zeroed in on the "horrifying recent pattern" of criminals murdering police officers during a report on Wednesday's Situation Room. Todd noted that "seven law enforcement officers [were] shot to death in a month – 24 officers shot and killed so far this year across America,"and reported that "the string of killings of officers in recent weeks...has really got the law enforcement community on edge." He also pointed out that "police advocates say a saturation of media coverage has contributed to the spike." CNN really showed its bias in reacting to two very different Supreme Court decisions this week. On Tuesday, the Court struck down a portion of the 1965 Voting Rights Act; in the hours that followed, CNN's coverage included four times as many critics of the decision as supporters (8 vs. 2). Then on Wednesday, the Court struck down the Defense of Marriage Act and permitted the nullification of California's Proposition 8 banning gay marriage. This time, CNN's coverage skewed in favor of the Court, with roughly three times as many on-air guests supporting that decision as opposing it (20 vs. 7). Right as CNN's The Situation Room reported the resignation of Pope Benedict XVI, correspondent Brian Todd launched into a litany of the "controversies" of his papacy and pushed the positive analysis to the bottom of his report. 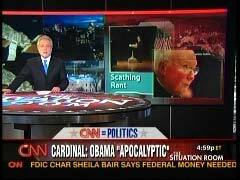 "Pope Benedict's papacy has been marked by serious controversies," began anchor Wolf Blitzer. Todd followed up that as far as "controversies" were concerned, "there was certainly no shortage of those during his papacy." Terrorists murdered an American ambassador in cold blood, and yet CNN shamelessly implied on Thursday that the makers of an anti-Islam movie might have blood on their very hands. "Do you and Mr. Bacile feel that you have any blood on your hands as a result of the violence?" correspondent Brian Todd asked a consultant for the film, Steve Klein. Anchor Don Lemon reported that the movie "may have led to the death of four Americans." CNN was basically acting as an apologist for Islamic terrorists. CNN is harping on the "partisan" connections of a group of military veterans criticizing President Obama, likening it to Swift Boat, yet it has helped further liberal partisan attacks in the past through its own biased coverage. "A new group of veterans, including former Navy SEALs, accuses President Obama of taking too much credit for the killing of Osama bin Laden. The group says it's nonpartisan. But a CNN investigation finds it has close links to the Republican Party," reported Joe Johns on Thursday's The Situation Room. After presidential candidate Michele Bachmann referred to North Korea as “the Wal-Mart of missile delivery systems,” CNN correspondent Brian Todd hyped the possible political backlash she could suffer for using Wal-Mart’s name in such a manner. 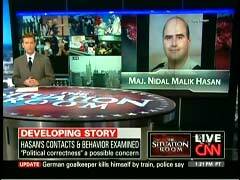 On Wednesday’s Situation Room, CNN’s Brian Todd actually considered that political correctness prevented earlier action against Ft. Hood shooter Nidal Hasan. Despite referencing “a senior investigative official who...said he has never heard any indication...that Hasan got any favorable treatment...before this shooting,” Todd also cited three others who were certain of the political correctness factor. 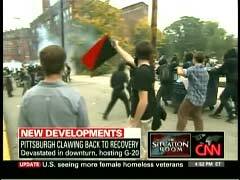 CNN correspondent Brian Todd featured anarchist protesters at the G-20 Summit in Pittsburgh during a report on Friday’s Situation Room, but despite their clear political affiliation, didn’t mention their extreme background. Todd devoted the first half of his report from the western Pennsylvania city to the protesters’ march. As the correspondent noted the “audible frustration on the streets by people who feel powerless over what they see as backroom deals made by a powerful few,” Todd ran video from the march where the oft-used half black, half red anarchy (more specifically, anarcho-syndicalist) flag was clearly visible (see above). On Tuesday’s Situation Room, CNN anchor Wolf Blitzer referred to a Catholic cardinal’s criticism of Barack Obama’s abortion position as a "scathing rant" and a "diatribe." A CNN graphic also used the "scathing rant" term, and Blitzer later referred to the cardinal’s words as a "blistering rant." All three of these terms came during Blitzer’s promos for a report by CNN correspondent Brian Todd, which focused on recent comments made by Cardinal James Francis Stafford, who referred to Obama’s pro-abortion stance as "aggressive, disruptive, and apocalyptic." Just before the top of the 5 pm Eastern hour, Blitzer gave the following promo for the segment: "Also, a scathing rant against Barack Obama from a rather surprising source, a Roman Catholic cardinal -- the story behind his diatribe against the president-elect." Ten minutes later, the CNN anchor gave another promo for Todd’s report, in which he stated that the cardinal unleashed "a blistering rant on the president-elect."